We offer live musicians, 7-10 piece bands, disc jockey's, mc's, audio production services and lighting for - wedding receptions, cocktail hours and ceremonies, corporate events, holiday parties and private events. Is the band available for my event? For information on availability and pricing please call us at +1 (416) 892-2527 or send your email to bookings@saturdaynightjive.com. When and where can I see you play live? Saturday Night Jive is proud to offer prospective clients a one-on-one showcase with the band at our private studio. This is a great way for you to hear the music you actually want to hear and a chance for us to learn more about your event. You will have your own 30 minutes of personal time with the band, to hear us play and ask any questions you may have. Book your appointment today and see us live. Most of our clients have booked our band's services 12 to 18 months in advance. Considering that many people begin planning for their events early, sooner is always better. Please call us at +1 416) 892-2527 or send your email to bookings@saturdaynightjive.com to see if we are available for your date. Can you save the date? If you are the first to inquire about a date, we will gladly place a hold on it for 14 days. Absolutely! Our band will go anywhere for your event. For travel rates please call +1 (416) 892-2527 or send your email to bookings@saturdaynightjive.com. Do you offer DJ and MC services? Yes! We can provide you with DJ and MC services with any of our band packages or as a separate package altogether. Yes! We have a general liability coverage as well as insurance for all our equipment. How many band members are in Saturday Night Jive? Saturday Night Jive is available as a 7-10 piece band. For more information about our band ensembles, please have a look at our band packages. Will the band I see be the band I get? 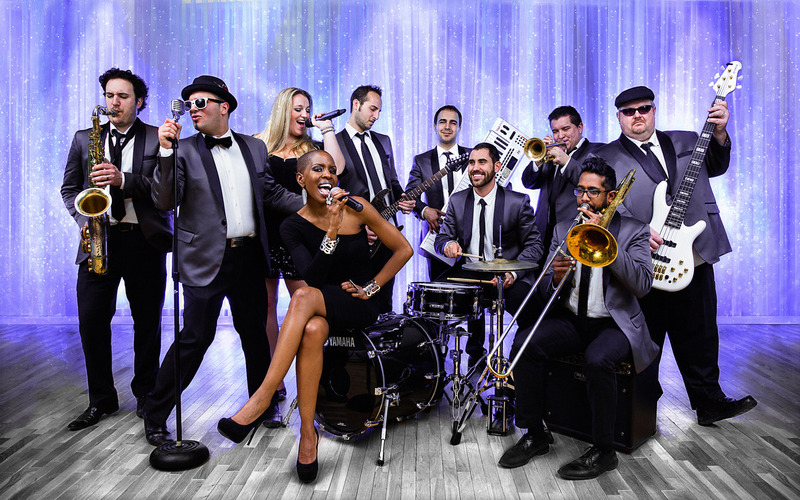 Saturday Night Jive is a fixed group of musicians comprised of some of the city's most talented performers. We ensure that the musicians and singers you see at a showcase or event will be the same individuals you get when you hire us. What if one of your band members gets sick or injured? While no common cold could keep any of our band members from performing at your event, If one of our musicians is too ill or injured and cannot play, then a performer of equal caliber will fill in for them to deliver the same high quality performance we are known for. This is our usual attire. Can you play all types of music? We are well versed in a wide selection of musical styles and genres to ensure all of your guests have an unforgettable time. Will your band learn a special song for me? If you do not see the song you are looking for on our master songlist, the band will gladly learn the music for your wedding ceremony, first dance or special parent dances. Depending on your events schedule, the band can perform anywhere from 45-60 songs. The band can play a selection of songs in Hebrew, Italian, and Spanish. If you require more, our DJ can certainly play any of your requests during the bands breaks. When do you arrive to set up your equipment? Considering that every party we do is unique, arrival and setup times may differ. For most events, our production team will be there to set up a minimum of 4-5 hours before your celebration begins. Depending on the band size and package you choose, the band can fit in a space anywhere between 12' x 12' to 20' x 16'. With regards to the power, a minimum of 4 separate, 15 amp circuits is required to ensure all audio/visual equipment operates properly at your event. Depending on your events schedule, each of our performance sets are approximately 45 minutes and our breaks can be anywhere from 15-20 minutes each. The amount of breaks the band takes depends on how many performance sets we play. The band will take one 15-20 minute break after each 45 minute performance. Do I need to offer meals to the band members? We kindly ask that a vendor meal is provided for each Saturday Night Jive team member working at your event. It can be a very long day so in order for us to ensure the amazing level of performances we are known for, a little fuel goes a long way. Who controls the volume level when the band is playing? It is very important to us that all of your guests are comfortable with the volume of the music. That is why we include a sound technician with all of our band packages. If at any time during your event you think the music is too loud or too soft, please let us know and our sound technician will be happy to adjust the volume. Yes! Our microphones are always available for you and your guests to use for speeches and announcements.